Central Industrial Security Force (CISF) Has Recently Published Recruitment for Indian Male Female Head Constable Temporary Posts Of Head Constable (Ministerial) 429 Posts. 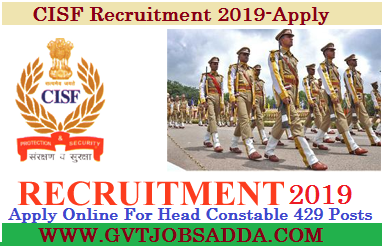 Those candidates who are interested in Recruitment 2019 Candidates may visit CISF official website download notification regarding Recruitment and apply online before last date of online apply.Brief information about CISF Recruitment 2019 Head Constable 429 Posts Has Given Below. CISF Recruitment 2019-Apply Online For Head Constable 429 Posts For More Details & Information Candidates Read Official Notification Regarding CISF Recruitment Before Apply Online.